81% of young people experience name calling and 50% were bullied because of appearance. 40% young people have had suicidal thoughts, 67% felt depressed because of being bullied and 39% have self-harmed. 68% said that bullying has had a huge impact on their self-esteem and 70% felt it has left them angry/aggressive. In addition, the 2017 NHS Staff Survey shows that bullying and harassment remains an extensive problem in the health sector with 24 per cent of all NHS staff (one in four people) having reported that they have experienced bullying in some way. Anti-Bullying Week 2018 takes place from the 12-16 November, organised by Anti-Bullying Alliance, this year the theme is ‘Choose Respect’. 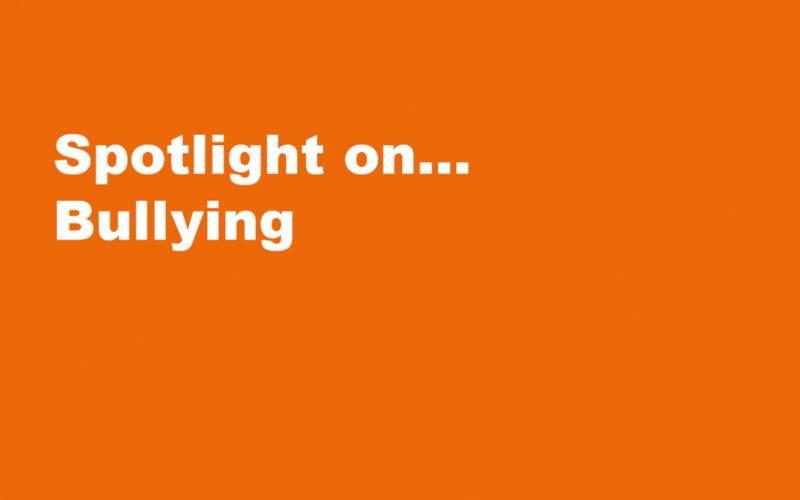 It offers a great platform to raise awareness of, and provide support for, those affected by bullying. “There is no legal definition of bullying. But it is usually defined as repeated behaviour which is intended to hurt someone either emotionally or physically and is often aimed at certain people because of their race, religion, gender or sexual orientation or any other aspect such as appearance or disability.” Reference: Bullying UK 2018. 3: Social bullying – also known as Relational bullying or emotional bullying, this can include leaving out, fake rumours, damaging a person’s reputation, excluding others, online and offline, turning friends against a person, etc. 4: Cyberbullying – being bullied online, via social networks, apps, messenger and phones, trolling, etc. 5: Sexualised bullying – unwanted sexual advances, pressurised to do sexual things, sexting, sexuality, spreading sexual rumours. No self-esteem, self-worth or confidence. Your self-esteem can help you build resilience against any forms of adversity in your life. Understanding yourself and taking time to work on yourself is important. Put yourself first when you need to, think about all the great things you do and can achieve. Build a support network of friends and loved ones who love you for you. Spend quality time with your network and do the things you love to do. Making necessary changes in all areas of your life is a constant thing to do. Even if change is hard to do, try to do it as things will and do change and it is better to be in front of it rather than behind. These are essential skills for all areas of life. When you are thinking of bullying, think about the vulnerability of the bully, this will make you realise that you are stronger than them and their behaviour is a cry for help whether it is low self-esteem, need to impress or issues in their lives. Thank you to Bullying UK for this information. Find out more about the organisation here. If you are on an Apprenticeship programme with us, you will have the opportunity to discuss any issues or concerns during your regular progress reviews. You can also contact your tutor, the rove centre, or talk to your employer (manager / training department) at any time. The NHS provides a comprehensive online library of helpful tools and resources to help you tackle bullying in the workplace; click here to access these. You can also call Bullying UK Helpline: 0808 800 2222, or email them here. Find out more about getting involved in Anti-Bullying week by visiting the Anti-Bullying Alliance website. You can also follow the events on social media using #antibullyingweek and #abw18.